I have just received this email from Jodi, whose Shetland Sheepdog named Kostya has been missing since early June. Please pass this on to anyone you think may be able to help. 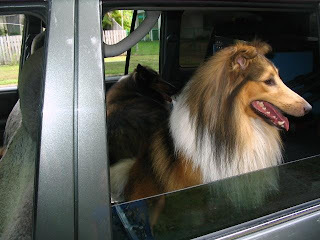 "Kostya the Shetland Sheepdog was lost on the Barkly Highway (Northern Territory) between Tennant Creek and the Qld border on 11 June 2009. He was one of my dad's 3 dogs who was with him when he died on the roadside there. Dad was travelling from Cairns at the time, so Kostya is very lost! Kostya ran into the bush when police found them, and was unable to be caught. The second dog Ranger was taken by the wonderful police officers in Tennant Creek and cared for until arrangements could be made to get him to me here on the Gold Coast. The third dog Jake was feared dead, as days prior Dad thought he had seen Jake being mauled by dingoes/dogs somewhere in the Territory. The Barkly Highway being the main one from Qld through the NT, means there is a chance Kostya was picked up by someone travelling and could now be anywhere in Australia.The area is remote, so if you did find him you wouldn't know where he'd come from and where to find the owner. I live on the Gold Coast but when I started ringing homesteads and roadhouses, I heard he may have been sighted. I packed my 12yr old daughter and the car, and we drove 2500km to search. The local paper in Tennant Creek kindly placed an article for me after I contacted them, which was published the day before we headed out. Upon arriving there, the police informed me that a dog had indeed been found but it wasn't Kostya. It was Jake (the one feared killed) who had been found and was with a family in Tennant Creek. We picked up both dogs and reunited them after 5 weeks. We searched for Kostya but had no luck and were told it's possible he had been picked up by a traveller. Kostya is a beautiful, sable/white 3yr old. Male, desexed but without microchip. I have his pedigree papers however. I'm contacting every pound, shelter, club and website I can think of. I've been interviewed by the ABC radio station in Alice Springs and Mt Isa. I've had an article in the Tennant Creek paper and won't give up on him. I made a promise to my Dad in our last phone call that I would always look after his dogs if something happened during his travels. Please, can you help me find him?Contact me on 0405 985 039 or at work on 07 5529 8011 anytime."